*Due to the complexity of manufacturing these belts, and the need to make them each with specific user-selected options, we must charge a $10.00 restocking fee on all returns or exchanges of Money Belts. We STRONGLY recommend using a measuring tape to check your correct size. Your pants size is not your correct belt size and is usually off by at least 2", and we have found that the markings on other belts are not always accurate. Please read and use our belt sizing guide. If your measured belt size is over 50" we strongly encourage you to check out the Easy-Fit sizing. This simplified sizing offers extra range of adjustment which makes correct sizing easier. This is important both to the belt doing its job for you and because the higher size ranges are custom and non-returnable. Sizes above 45" or below 30" in regular sizing are also considered custom and non-returnable. The Wilderness Money Belt takes everything that's great about our complete line of belts and makes them even better! You can build exactly the robust, secure, covert money belt you have always wanted with all the options for buckles, colors, stiffness, width, and length that we offer in our other belts. The back of the belt features a flat, zippered pocket along most of its length. Size varies with the belt width, but they can each hold folded paper currency and most coinage. The 1½" and 1¾" wide belts use #7 size zippers. The wider belts with larger zippers offer slightly more room for storage, but also stick up slightly higher. However, there were no complaints about the larger zipper from users during testing. The zipper's metal pull-tabs have been replaced by 2mm knotted nylon cord. This provides a good zipper pull and does not hang below the width of the belt. 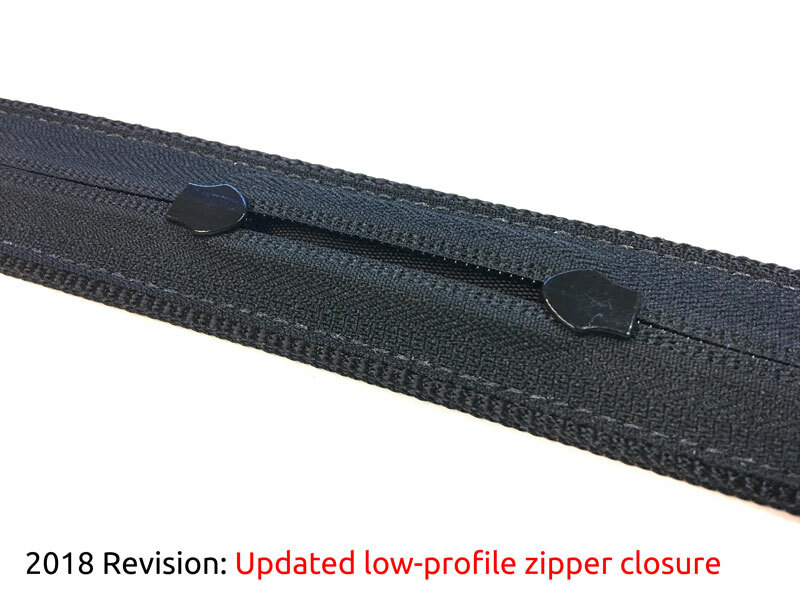 Our development team found no discomfort issues in testing due to the low-profile of the zippers and pulls. All money belt pockets feature a double pull. As with all zipper money belts, the zipper sliders can catch on the ends of the bills. By pulling out or "tenting" the zipper by the pull cords, this condition can be minimized. In the Old West, many cowboy's prized gunbelts were also money belts. More than a century later, The Wilderness has brought this smart idea back to reality. Whether a tourist, adventurer, soldier or reporter, the Wilderness Money Belt will help you keep your valuables on you and safe while in far flung lands or just the backwoods of home. *Please note that due to the wide spectrum of possible options, our Wilderness Money Belts are made when ordered and will typically require at least 5 business days to manufacture. The Original Instructor Belt was developed in 1983 and has been refined ever since, now offering higher quality and more options than ever. It is a very strong belt with a specially designed carbon steel V-ring buckle coated. They have corrosion-resistant buckles finished with Robar's premium Roguard coating which will not chip like cheaper coatings found on many Instructor Belt copies. The belt was originally designed to clip into a secure system while "instructing" others in high places during mountain rescue training, although they can be used for emergency rappelling with proper training. Our belts have also proven to be a fantastic everyday pants belt for casual or outdoor use, as well as concealed-carry. The belt body is constructed of two layers of premium nylon webbing made to our specifications. A proprietary polymer treatment on all of our belt tabs actually soaks into the core of our nylon and bonds with it, providing permanent protection from fraying. With proper use, your Original Instructor Belt should give you literally years of faithful service. Although not intended to replace a rappelling harness or to absorb a fall, the Instructor Belt provides peace of mind over the alternative -- no protection at all. We strongly recommend it for anyone involved in law enforcement, special warfare, or rescue operations where there is a risk of falling out of a helicopter. It has been standard operating procedure for years within the Phoenix Special Assignments Unit (SWAT) to clip into a Wilderness Original Instructor Belt during airborne or skid-riding ops. It has also been used by many professionals who like the safety of being clipped in when working in cherry pickers (the belt's first "save") or other tall structures. This belt is not intended to replace a standard rappelling harness with leg straps in normal operations. It is intended as an emergency option to clip into when there is a risk of falling, or for emergency rappelling when no other option is available. It will be very uncomfortable to rappel with, but it may save your life -- which is what we intended. The Instructor Belt must be used in conjunction with a harness or rope seat during any non-emergency situation or rappel training. These are inherently dangerous operations which can result in death or serious injury; proper training in these skills is absolutely required. The Original Instructor Belt and Titanium Instructor Belt are designed to be a serious pieces of rescue/safety equipment that you may have to bet your life on. In lab testing, our Original Instructor Belt has withstood a minimum of 5,900 lbs. of static stress without failing, to more than 8,000 lbs. of static stress without failing. Results vary with model. See testing data. Ask those who try to copy us if they continually refine the construction and materials they use? Or do they use inferior materials and designs, like heat-sealing or flimsy metal tabs on the end that tear off and shred your belt within a year or two? You don't have to ask us if our gear is top quality; we stand behind our products and include documentation of these results with every Original Instructor Belt, and we post them here on our website. The Original Titanium Instructor Belt buckle is cast in the U.S.A. from aerospace-grade Ti6Al-4V alloy, the 1½" Ti buckle is almost 50% lighter than our steel buckle (2-3/8 oz. Ti versus 4-1/8 oz. for the 1¾" steel, 4-5/8 oz. for the 1½" steel), ultra corrosion-resistant for maritime applications, and non-magnetic. Make no mistake, our new proprietary 1½" titanium buckle is as functional as it is good looking. The attractive silvery-gray natural-finish titanium buckle is more than just a pretty face. The TiBelt buckle loses none of the rescue and emergencey securing utility of the conventional steel buckle. The Instructor Belt series was originally designed to clip into a secure system while "instructing" others in high places during mountain rescue training, although they can be used for emergency rappelling with proper training. The Ti buckle follows that tradition. When lab tested to the point of failure, our proprietary titanium buckle withstood more than 5,000 lbs. of static weight. The Frequent Flyer uses 100% non-metallic ring buckles made of Delrin. While the metal zippers on the Money Belt prevent it from being able to pass through metal detectors, the advantages of the ultra lightweight polymer buckles still make this the lightest of the belts. Naturally, it still meets the standards for quality and durability that we established with our Original Instructor Belts. The FF Belts are stylish for casual wear, come in a variety of widths to fit most pants, and are tough enough to hold up not just your pants and cell phone on a trip, but your full-size pistol, spare ammunition and a tactical flashlight back at home. We are told an additional benefit of the Delrin buckle is that you won't mar your car's paint job while leaning over and washing it! They also look sharp doing it, going well with cargo pants, casual slacks, shorts or jeans. The design and construction made famous by our Original Instructor Belts is used in the Frequent Flyer-series as well. As with all of our tactical belts, two layers of webbing are used resulting in a durable belt that holds its shape and carries weight well. Our belts come in three stiffness grades to match your mission. The 5-stitch model, our favorite and most popular, offers five stitch lines along the length of the belt which significantly stiffen it and enhance load bearing. It's vertical rigidity is similar to a high-quality leather gunbelt, yet it is horizontally and rotationally flexible for comfort. We think this is the best one for most gun-carrying operations, both inside-the-pants and belt holsters. Belts are available in black, Wilderness Coyote, and Wilderness Olive Drab (sort of a smokey gray-green that falls halfway between Ranger Green and Army foliage green). Our Frequent Flyer buckles can be assembled into three belt widths: 1½", 1¾", and 1¼". Our Instructor Belt buckles can be assembled into two belt widths: 1½" and 1¾". Our Titanium buckle is only available in 1½"-width. Our original 1½"-wide belts fit most jeans and BDUs very well (please measure belt loops to be sure! We have found many off-brands have odd sizes that may not be correct). Due to overwhelming demand we also produce 1¼" belts that will fit a wider variety of pants and shorts. The narrow 1¼" belts are great sport belts and decent gun belts due to the stiffness of their proprietary webbing, the same as used in our slings. You may choose either standard sizing in every-inch increments, or Easy-Fit sizing for a slightly wider adjustment range (*please refer to chart at right). Note that the Easy-Fit sizing results in a longer belt tongue which may interfere with holsters for some users. If it's not a Wilderness Original Instructor Belt, it's just a copy. We have never, and will never, produce our belts under any name but our own. We have on rare occasion done signature-line belts for our industry partners, like Gunsite and EOTAC, but always with our label as well as theirs. This way you can be guaranteed you are getting our quality, not a cheap substitute. **A NOTE ABOUT METAL DETECTORS: It should be kept in mind that the metal zipper sliders (and any coins in the money belt) could set off metal detectors. We await first-hand reports.